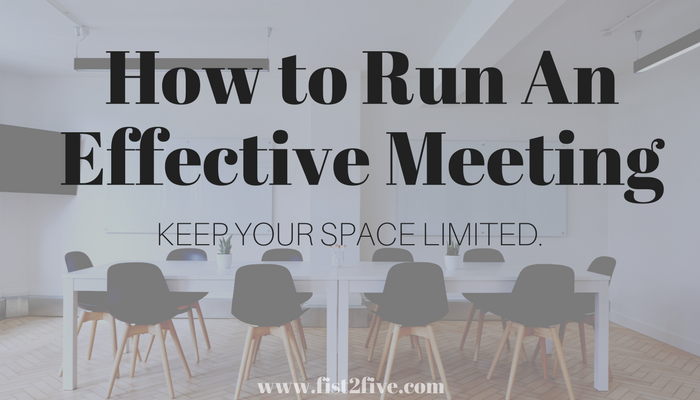 HOW TO RUN AN EFFECTIVE MEETING: Assign Specific Action Steps. The goal of every meeting is to agree to take specific action regarding a specific need or project. Bottom line: Everyone should know what is required of them by the end of the meeting. Most people don't. Many meetings conclude with a vague sense of what needs to be done and an uncertainty of when and who it is to be done by. There is a simple solution to this. Go old school. 1. Provide Paper + Pens. Phones, tablets, and laptops are distractions. A simple piece of paper and pen will keep everyone on the same page. Now, before you dismiss "writing things down" as an archaic, you should know that Facebook COO, Sheryl Sandberg walks into every meeting with a spiral notebook and pen and she seems to be getting a lot done. I, personally, like to use a bullet journal. At the end of the day, a simple piece of paper and pen will suffice. 2. Assign SPECIFIC What, When and Who for each Action Step. It is the job of the leader to assign the what, when and who for each action step. It is most effective when the leader is specific to what needs to be accomplished, who is responsible for accomplishing it and when it needs to be accomplished by. "Can we make sure that the proposed budget is submitted to me by the end of the next week?" "Jennifer, will you make sure that proposed budget for the Gala and is submitted to me by 5:00 pm on Thursday via email?" The latter is more effective because it is specific in who is responsible, what they are responsible for doing and when it needs to be completed. When actions steps are vague, few will step up to complete them. This is because uncertainty is the atmosphere where "fear of failure" thrives. Remove the fear by removing the uncertainty. 3. Ask everyone to keep each other accountable to their assigned action step. Accountability is one of the secret ingredients in productivity. Team members should know who is responsible for each action step and when it needs to be done by. This why "writing it down" is helpful. Every knows the part they play. Team members can choose to later enter the written action steps into their chosen device (phone, tablet, or laptop) but for the sake of time and staying on the same page: EVERYONE SHOULD WRITE DOWN THE ACTION STEPS. When there is a question about a specific action step, it will be clear who to speak to. A clear plan of ACTION will make our meetings effective which will ultimately make our organization more productive. There is much good to be done and we need a lot of time to do it. We can use our meetings wisely so we can accomplish the mission set before us. Older PostHOW TO RUN AN EFFECTIVE MEETING: Keep the Space Limited.